Stumped on where to enjoy Christmas dinner (or brunch) this year? These restaurants are open and offering special feasts that will add a dash of cheer to your holiday festivities. The NoMad will serve breakfast Christmas Day from 7 a.m. till noon in the lobby, then offer a prix fixe menu from 2 to 8:30 p.m. Options include appetizers such as curried squash soup or roasted beet salad, a selection of mains like seared scallops or filet mignon (you can also get the famed NoMad roast chicken as a $15 supplement), plus family-style sides like black truffle potato purée and charred Brussels sprouts. For dessert, there’s “milk & honey” ice cream or dark chocolate ganache with sea salt and maple ice cream. 649 S. Olive St., downtown. At his meat-focused Hollywood restaurant, Curtis Stone is offering a five-course dinner from 1 to 7 p.m. for $85. On the menu: wild mushroom soup, roasted scallops, grilled New York strip with potatoes, and chocolate cake with eggnog ice cream. 6600 Sunset Blvd., Hollywood. You can always count on this iconic delicatessen when you crave corned beef and matzo ball soup—it’s open year-round from 10 a.m. to 2 a.m. Pop into the wine shop next-door afterward and get yourself something to sip by the fire. 8017 Sunset Blvd., Los Angeles. Jean-Georges Vongerichten’s restaurant in the Waldorf Astoria Beverly Hills is going big with a ritzy Christmas Day brunch for $155 a person. 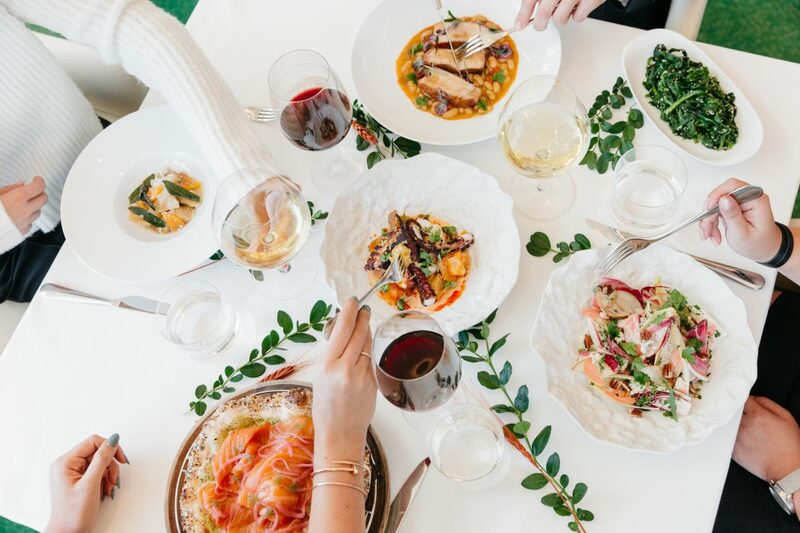 The menu includes truffle hamachi toast and Wagyu carpaccio to start, Maine lobster and spice-crusted squab, and a variety of holiday desserts to share. 9850 Wilshire Blvd., Beverly Hills. Game for some game meat? Chef Adam Horton is offering an early bird dinner from 4 to 9 p.m. Christmas Day for $98 a person. The menu includes roasted apple salad, “Christmas Ham” pork belly, braised short ribs, cranberry-glazed elk, and banana-huckleberry bread pudding. 419 Cold Canyon Rd., Calabasas. The Langham’s steakhouse will serve dinner from 4 to 9 p.m. Christmas Day, priced at $145 a person. Chef Dominique Shelton’s menu includes California-inspired takes on holidays classics, like endive salad, beef Wellington, and a roasted apple tarte tatin. 1401 S. Oak Knoll Ave., Pasadena. Josiah Citrin is serving a $65 three-course menu available from 5:30 to 8:30 p.m. at his mezzanine restaurant in the Line Hotel. Choose between options like chestnut ravioli or seared scallops to start, beef Wellington or roasted Sonoma duck breast as entrees, and chestnut cheesecake or Buche de Noel for dessert. 3515 Wilshire Blvd., Koreatown. Casey Lane’s Italian spot in the La Peer Hotel is offering a three-course Christmas dinner 4 to 8 p.m. at $75 a person. Start with amuse-bouches like smoked sturgeon rillettes, truffled cauliflower soup, and cheese arancini, then choose from entrées like wood-roasted duck or rotisserie prime rib, served with a variety of traditional sides. Dessert is a traditional spiced layer cake. 623 N. La Peer Dr., West Hollywood. Best Girl at Ace Hotel DTLA is serving brunch until 3pm, then offering a special á la carte holiday dinner menu from 5 p.m. to 11 p.m. Cozy up with dishes like oysters Rockefeller, salt cod brandade with grilled bread, gratinéed potato gnocchi with sage and Tahitian squash, shellfish-tomato stew, and slow-roasted prime rib with Yorkshire pudding. For dessert, there’s gingerbread trifle with rum pastry cream and winter fruit compote. 927 S. Broadway, downtown, bestgirldtla.com. Inspired by Dr. Seuss’ How the Grinch Stole Christmas!, Hotel Figueroa is serving a “Christmas Feast” at poolside restaurant Veranda, available from 3 to 8 p.m. for $55 a person. The themed menu includes “Roast Beast” (roast reef rib and whole roast duck), “Who Hash” (roasted root vegetables with caramelized onion) and “Stolen Christmas Pie.” 939 S. Figueroa St., downtown, verandadtla.com. RELATED: The Procrastinator’s Guide to Buying Last-Minute Gifts Throughout L.A.
Next articleNight on Broadway Is off for 2019. Could This Monthly Series Fill the Void?